Home » S2000…. after the LS7 engine swap! 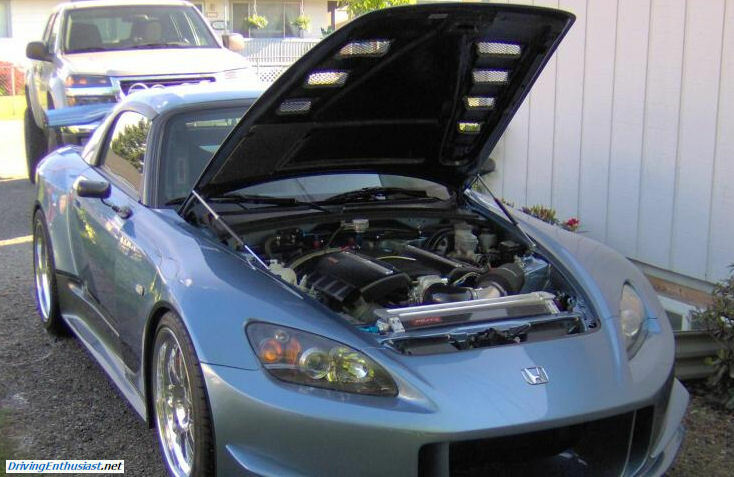 In followup to an earlier post about S2000 engine swaps, there’s always the question of what happens to the S2000 after it’s engine was removed for use elsewhere. Most of the time the car had been wrecked and the engine is an orphan. But not this time – instead a good S2000 has had an engine transplanted into it. And not just any engine: this time it’s a Chevy small block that has been transplanted into an S2000. And not just any Chevy engine – it’s an LS7! Yes, this is a 505-HP S2000! It’s a very well done and clean swap – we’d take it! And the good news (for us anyway) is that the owner has had to reluctantly put the LS7 S2000 up for sale – right now – on eBay Motors. We’d recommend that you jump on this quickly – it’s a very rare opportunity to get a terrific and unique car. Other details: a T-56 transmission is used, along with a heavy-duty Cobra-R 8.8 Ford IRS differential. Both of these features are absolutely the way to go, the only way to do this type of swap. And note, too, that the instrument panel is fully functional: just more evidence of a swap done well. V-8 Miatas are old news… been there, done that. The new news is V-8 S2000s. With better chassis integrity than a Miata, more interior room, more room for exhaust routing (always the fatal flaw of any V-8 Miata swap), more room for properly-sized wheels and tires (what good is 505 HP if you can’t put it to the ground? ), and enough room under the hood for the swap without having to perform major cuts and hacks. This swap makes so much more sense in an S2000. Need to learn more about V-8 S2000s? YouTube is full of videos of them: http://www.youtube.com/results?search_query=v8+s2000 – and there is even a forum specifically for this: http://www.v8s2000.com.